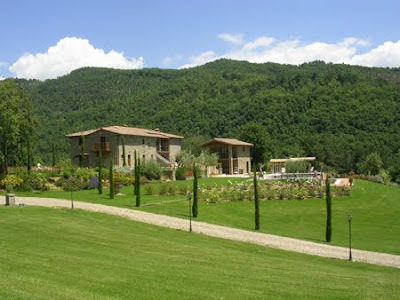 Striano is a luxury Tuscan villa renovated and designed to a very high standard. A classic and sophisticated Italian Villa perfect for large family groups and superbly positioned. Spacious and airy, the property has a total of 6 lovely bedrooms with ensuite bathrooms in Travertino marble. The master suite has wooden floors throughout and wonderful views over the valley and the garden. Off the master bedroom is a single room with bed, which can be used as a dressing room or another single bedroom. In the master ensuite bathroom there are twin Travertine hand basins, large gilded mirrors and frescos, a separate Travertine shower cubicle and a large claw foot bath. The ground floor 3 enormous living rooms with huge Tuscan style open fireplaces, first floor sitting room and large balcony. There is a large central dining room with and AGA stove as the centerpiece against one wall. From the dining room you walk through to the luxuriously fitted kitchen. Also from the dining room you can access an independent ground floor bedroom suite with bathroom and its own French door for access to the outside. Striano has its own private large infinity designed swimming pool with views down the valley. There is a lower sunbath pool into which flows water from the upper pool. The pool is 12m x 8m with a 12m x 2m sunbath pool. Also in the pool area is an outdoor kitchen and gas barbecue grill. The gardens are beautifully landscaped and designed to the highest quality: with an Italian themed garden (with a maze of box hedges, statues and pots), cypress trees, olive trees, vines, pergolas, pretty English rose garden and lots of lush lawns, all fully irrigated. This renovated property looks amazing. I especially like the setting. It is exactly the type of setting that imagine Italy to be like.